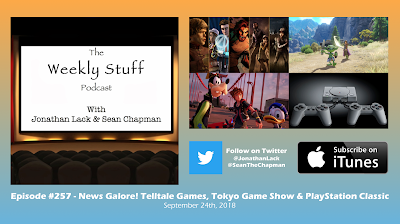 We really live up to the podcast’s name this week, covering a wide assortment of stuff, including a large grab bag of video game, TV, and movie news from the past week. From the sudden closure of Telltale Games to trailers and announcements from the Tokyo Game Show to the launch of Nintendo’s online service to Sony’s surprise unveiling of the PlayStation Classic, this week brought a lot of surprising news to parse through. Sean also recommends some Spider-Man comics from the 1980s, Jonathan reviews Paul Feig’s A Simple Favor, and we give some more spoiler-free impressions of Dragon Quest XI, now that Sean has also had some time with this truly amazing game.